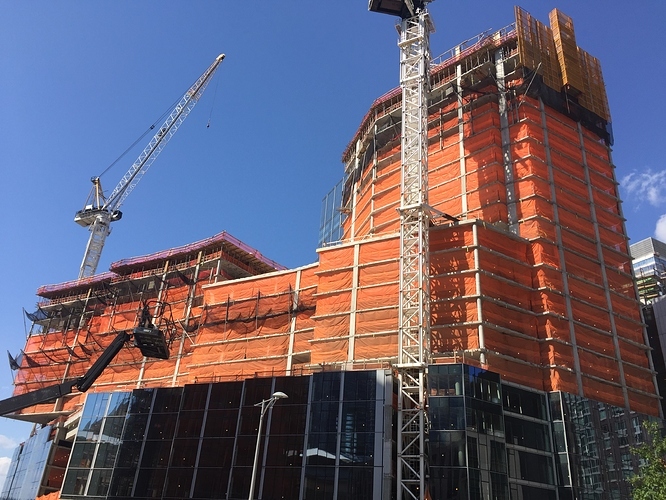 The southwestern blocks of the Upper West Side have been in a state of constant flux over the past few years, with several major developments either wrapping up or breaking ground across the last wide-open spaces remaining in the neighborhood. 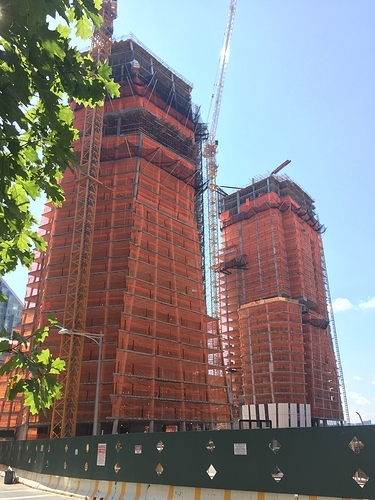 Perhaps the largest project within this area is GID Development’s Waterline Square, formerly known as Riverside Center, where construction on three new buildings is now pushing upwards and into the skyline. The three skyscrapers will eventually stand between 34 and 38 floors to their peaks, with the tallest of the bunch set to top-out 478 feet above street level. Kohn Pedersen Fox is designing the largest building, which will come in a two-towered format and comprise 1.2 million square feet, while architects Rafael Vinoly and Richard Meier are behind the other two towers. There will be 1,132 units between the three buildings in the complex. Riverside Center was originally conceived in a master plan created by Christian de Portzamparc, who was responsible for the first residential supertall in New York City, One57. 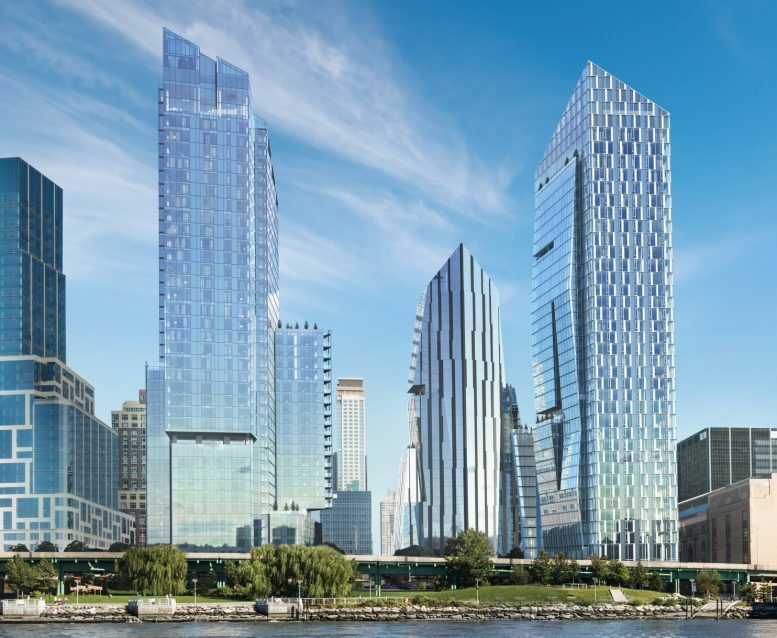 After that submission went through a grueling approval process, the five buildings that comprise the site saw substantial design changes, before construction began on two towers at One West End Avenue and 21 West End Avenue. 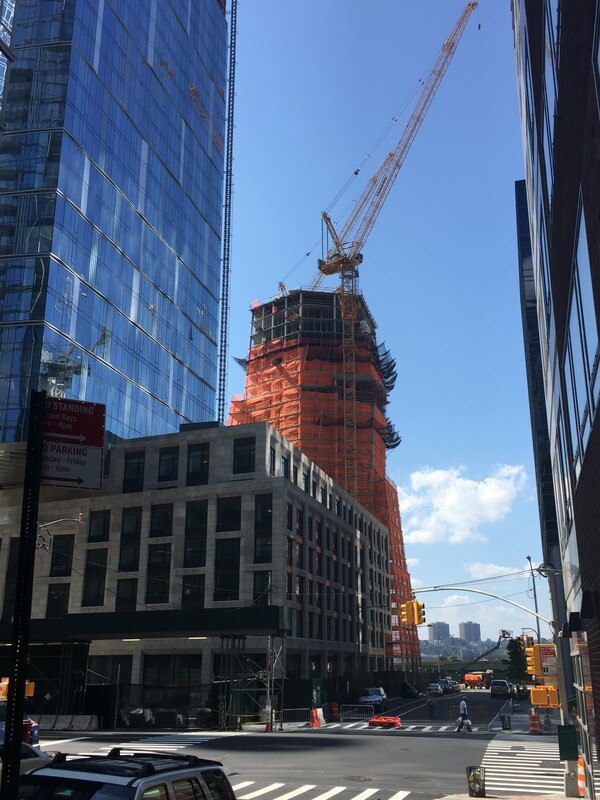 The photos come from JC_Heights, and show that besides continued verticality, the first of the facade is also going in on the two towers designed by Kohn Pedersen Fox and Richard Meier. Completion of the entire site is expected by 2019, and Hill + West Architects are the architects of record. 2 Comments on "Waterline Square Making Headway, Upper West Side"